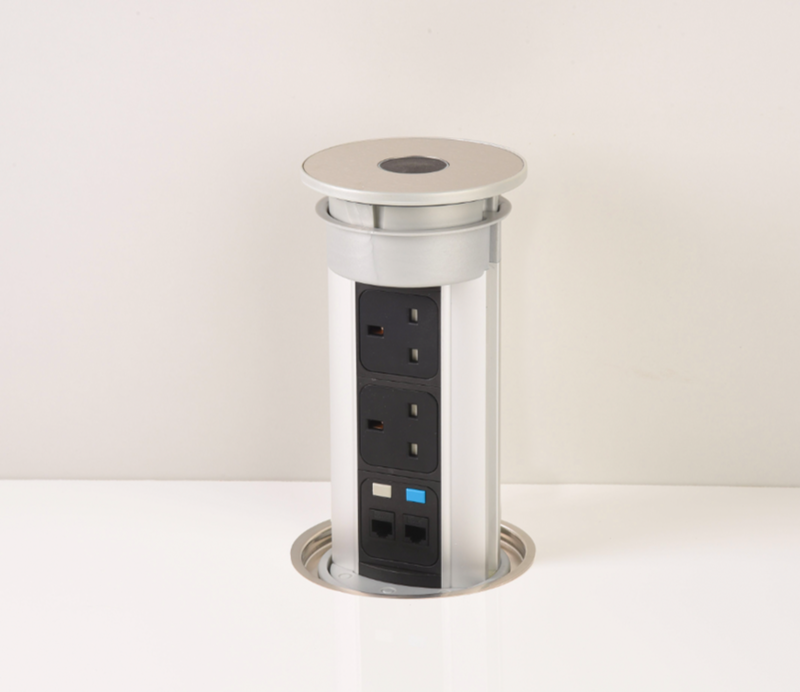 100mm Diameter Pop Up Power Unit with 2x UK Power Sockets & 2x Category 5 Data Ports (RJ45).� Just peel back the protective film�and drop it in a predrilled hole ready to go.� Supplied with a standard 2 metre lead and fitted plug for any�UK Standard 3 pin socket -�just like an extension socket! The�Matt Chrome Top Disc compliments the All-Silver surround and this particular model has a Black Electrics Panel and you just depress the Black button to�'pop-up' the unit about 25-30mm�- and then draw it into position. Adds that real wow factor to any kitchen, especially when used in conjunction with the flush fit adaptor ring - will require a 124mm hole. We grade the units A, B or C which is reflected in the price reductions but none are what you'd call damaged and are certainly perfectly saleable. However, for those with a critical eye and if you;re wanting a unit in Perfe condition straight from the factory, then we'd recommend you buy new - or at least come and see them for yourselves in our Banbury showroom.